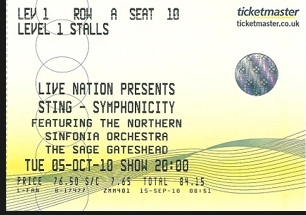 A capacity audience in Hall One was treated to orchestral versions of hits such as Roxanne, dating from Sting's days with The Police, and later numbers including 'Russians', from his 1985 debut solo album, and 1993's 'Fields of Gold'. This was just the latest stop on Sting's 'Symphonicities' world tour but he seemed to enjoy it just as much as his last appearance here in December for the Sage's fifth birthday celebrations. With the bushy beard gone, Sting looked lean and sleek alongside his even leaner and sleeker backing singer, Jo Laurie. As well as the Northern Sinfonia musicians, all dressed in black, Sting was joined by members of his regular ensemble of accompanists. There were guest appearances by Northumbrian piper Kathryn Tickell and her brother Peter on fiddle while Northern Sinfonia lead violinist Kyra Humphries and cellist Louisa Tuck were also given the chance to shine. Sting said: "I used to watch the Sinfonia as a kid at the City Hall and the idea of me standing up and singing with them was beyond fantasy." He reminisced about his father whose one piece of advice to him as a boy was that he should to go to sea. "I was a musician on a cruise ship once and I hated it. But what he meant was: live an exciting life. "Obviously I disappointed him," he joked. He spoke of his boyhood love of Westerns on TV - Wagon Train, Bonanza and The Virginian - and his love of country music. "I tried writing country songs," he said. "But there's a lack of authenticity. I'm from Wallsend." However, he sang one called 'I Hung My Head' which he reckoned had made the grade because the late Johnny Cash did a cover version. The audience laughed, cheered and clapped along, which might have been a novel experience for the North East's professional orchestra. Earlier in the day Sting gave his backing to the bid to bring the World Cup to England and the North East in 2018, saying St James' Park would make a "fantastic" venue.